This is one of the future flower fields. For now, it is actually a beautiful spot to capture portraits because of the light that filters through the trees and vines. We have already planted Ranunculus, Narcissus and Tulips for spring harvest. We are currently building raised planter beds for the garden out of recycled pallets and vinyl fencing materials. We believe in re-using, re-cycling, and re-purposing as much as possible, so we look for ways to utilize existing materials in new ways. Our fences are all built with repurposed pallets. The barn was once home to 6 white Arabian horses. They left behind broken floors, layers of dirt and old manure. The ceilings were lined with cobwebs. The walls were covered in decades of horse debris and chewed-up barn stall doors lined the center aisle. In other words…it was a real barn. We worked hard getting it ready for our wedding. The old barn wood walls were taken down, salvaged and reclaimed into farmhouse tables loaded with character. 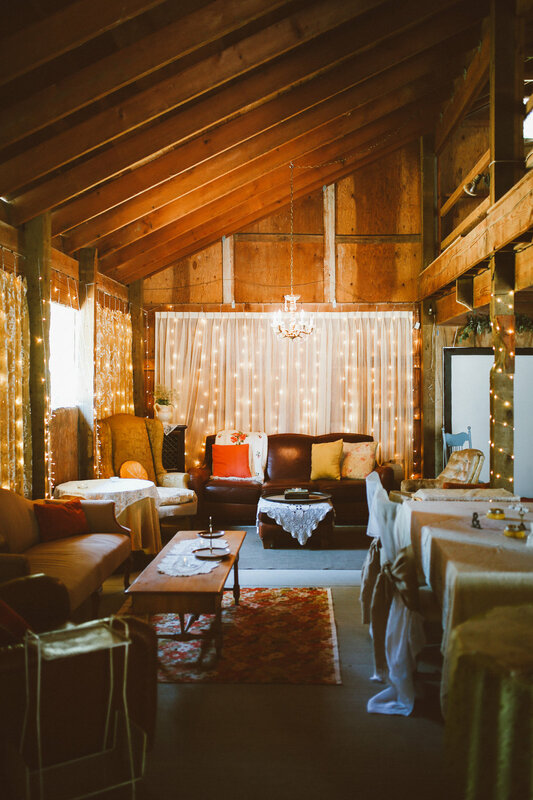 Getting everything ready in time for our wedding was quite the feat...Stacie was literally belt-sanding the tables for the wedding 3 days before the big day, along with hanging lights, and arranging the furniture in the barn! Meanwhile, a lot of trips to various thrift stores were made. St. Vincent de Paul, we love you. Besides the twinkly lights, everything you see in these photos was thrifted, found for free, or made by Avery! It was all extremely affordable and so much fun to find! Currently the barn is undergoing renovation. We are installing heating and cooling systems, insulation, windows, drywall, doors and lighting. Most of the “new” materials for the barn have all been through local salvage companies. Our favorite place for obtaining salvaged building materials is Second Use in Seattle, Wa.